Ray first started practising the martial arts in 1965 with Mr. Tommy Morris (Shotokan), who he was with until 1968; by which time he had achieved the level of brown belt. Upon moving to Jersey, he found himself just practising with a small group of friends (1969 - 1973), until he founded the Jersey Branch of Shoto-kai Karate under Sensei Harada , in 1974. It was during this time with Sensei Harada (who had practised Karate under Master Funikoshi in Japan) that Ray was graded to 1st Dan Black Belt (1980). In 1981, Ray left the Shoto-kai school to join the Shoto-ryu school under Sensei Viv Nash, who had himself practised under Sensei Harada for over 18 years before founding the Shoto-ryu style of Karate. Sensei Viv Nash was graded to 6th Dan in 1987 and had attained 8th Dan before he passed away in May 2009. Sensei Viv Nash had introduced the study of the principles of Tai-Chi because they were complimentary to the type of Karate being practised. Initially, it was only for Black Belts but, as interest grew among the public, it was subsequently offered to all as a form of exercise for developing the mind and body, with separate classes for studying the Martial Arts aspect of Tai-Chi. During his time practising under Sensei Viv Nash, Ray was graded to 2nd Dan, in 1982, 3rd Dan in 1986, 4th Dan in 1992 and was graded to 5th Dan in 2000. 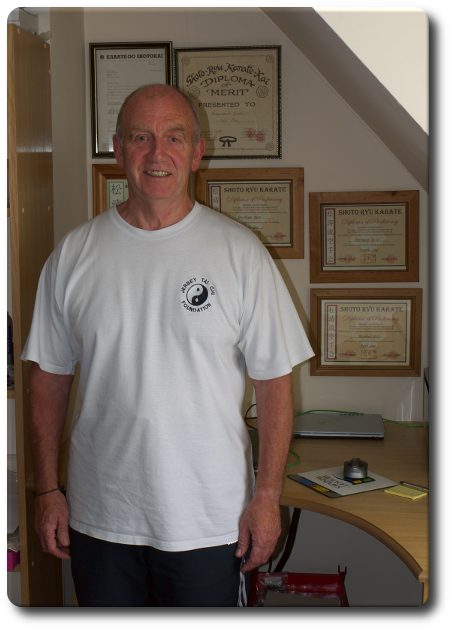 It was in 1985 that Ray established the Jersey Tai-Chi Foundation and, as a result of enquiries from a group in Guernsey, the Guernsey Tai-Chi Foundation was established in 1990. It was the introduction to Tai Chi which led Raymond to undertake intensive practice and research relating to the Tai Chi discipline. It was the medicinal benefits of the exercise that caught Raymond's focus. Tai Chi is a gentle yet extremely effective exercise available to those of all age groups and fitness levels. Raymond ensures that the foundation offers both the benefits of exercise and seperate Martial Arts classes depending on the focus of the students.